Check out our Bulk Price Discounts! NutraSense™ is proud to announce an innovative, new joint health formula, JointSense™ with NEM™, that delivers a unique combination of proven joint support ingredients. What is JointSense™ with NEM™? Recognizing that JointSense™ with NEM™ consists of Glucosamine, Chondroitin, Hyaluronic acid (HA), and Collagen, ESM Technologies commissioned the following two studies which were designed to determine the effects of 500 mg of NEM™ per day on joint and soft tissue pain. Pain assessment ratings, range of motion and pain associated with range of motion measurements were statistically evaluated using one-way analysis of variance and a means comparison analysis. Subjects studied performed evaluations on levels of pain before treatment, daily for the first 7 days and at day 30. Average pain levels were significantly less at day 7 than day 1. The population of this study included subjects with lower back pain, knee, hip, shoulder, leg, and hand pain. Many subjects reported multiple pain sites and two subjects were diagnosed with Fibromyalgia. There were two phases evaluated in this clinical. Phase one: Randomized double-arm evaluation of two NEM™ compositions for 7 days. Phase two: Evaluation of standard NEM™ composition from day 8 to day 30. No significant differences between the two NEM™ compositions in phase one. While we champion the use of Glucosamine and Chondroitin, the individual or combined use of these two products does not work for everyone. 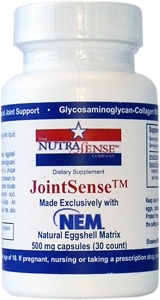 By offering JointSense™ with NEM™, we feel that we can provide our customers with a broad and effective line of Joint Healthcare products that includes: Glucosamine ES, Glucosamine Plus Chondroitin, Glucosamine Plus MSM, and now, JointSense™ with NEM™. Suggested Dosage: As a dietary supplement, adults take one capsule daily with liquid or as directed by your health professional. Caution: If you have an allergy to eggs, consult your health professional before using.